I’m feeling a bit of disappointment today, as this is the day we had originally hoped to be in our new house. That house is starting to feel like the illusive dream that will never materialize, always just out of reach. But I’m trying not to wallow in my disappointment too much. I still have plenty to do around the condo to keep me busy for the next month, and hopefully our closing date at the end of this month will stick. And of course, until then, I’m planning and dreaming about the changes I want to make to the house. Oh, how I wish I could show you pictures of the inside!! But you’ll have to wait another month, right along with me. I find myself doing a lot of planning and thinking and dreaming about what I want my kitchen to look like. The current kitchen is just a small little box filled with outdated cabinets and finishes. It all has to go. Every bit of it. The cabinets aren’t even ones that a coat of paint can save. So while I’m still dreaming about and deciding on all of the details of my future kitchen, I think the one detail I’m certain about is that I want concrete countertops. And I want to do them myself…of course. 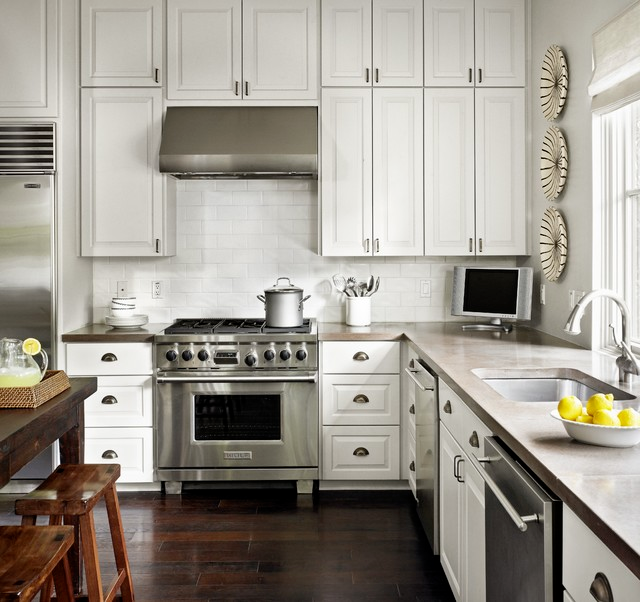 Here’s a beautiful example of what I like from Houzz. I don’t like stained concrete countertops at all. I don’t like that sparkly stuff that some people add to theirs to simulate the look of granite (or actually quartz) countertops. I just like the solid natural soft gray color with the subtle color differences that are characteristic of concrete. I’ve admired concrete countertops for years now, and I’ve read many books and the tutorials on how to DIY them over the years. I remember reading a book several years ago written by a man named Fu-Tung Cheng on how to make your own concrete countertops. He was pretty much the first person (that I know of) to try to make this process accessible for the DIYer. But quite honestly, the process seemed very overwhelming, starting with with building a mold out of melamine, and of course, the mold had to include the perfect sized holes for your sink, faucet, etc. And you had to build them in pieces so that they could be carried and fit through doorways, etc. Then once the countertops were made, you had to move them into place. Can you imagine how much those would weigh?? It was one of those DIY projects that only the super ambitious would ever attempt. So I was convinced that if I wanted this look, I would have to do something like what Kara and Tim Paslay did on these countertops, covering the existing countertops with a concrete surface called Ardex. The result is pretty amazing, but the problem is that you have to start out with countertops that are in good condition and worth saving. I won’t have that to work with in my “new” kitchen. Plus, as amazing as that countertop looks, I really have my heart set on having the real thing if I’m going to go with concrete. So this weekend, I decided to do just a bit of research to see if there were any updated processes that make concrete countertops easier and more attainable for the regular DIYer like me. And lo and behold, look what I found!! Cast in place countertops that actually look reasonably simple to do!!! AND, you can get a pretty edge detail also, so you’re not stuck with just a square edge if you prefer something fancier. And since you cast them in place, there are no seams at all. The entire countertop is one solid piece. Y’all! That looks doable, right? But I still have a while to wait. Even after we get into the house, we’ll have to save up money for our remodel, which could take a while. So until then, I might try my hand at smaller concrete projects. Since I’ve never worked with concrete before, I’m sure it would be beneficial for me to just get the feel of it so that I can know what to expect when I tackle the countertop project. Perhaps I’ll do something like this amazing concrete table top that Tim made. Or perhaps something smaller, like a coffee table top. 🙂 I’m just anxious to get my hands into some concrete so I can get a feel for it. Have you ever made anything with concrete? Have you ever made concrete countertops or table tops? If so, I’d love to hear about your experience, and any pointers you might have!! We made our own 2 years ago and absolutely love them! They have held up great. We did a 3 part tutorial on our blog and I definitely think its DIYable. You will need some extra hands to move it all but it’s so worth it! Good luck with your new kitchen! The resources section even has a step by step DIY manual. We had this done on our floors because we didn’t want the mess and expense of concrete staining and polishing and they have held up beautifully for 15 years with lots of heavy traffic, dogs and general abuse. The base comes in white or gray and can be tinted (if wanted). Thank you! Thank you! Thank you!!!! I have been looking at doing concrete counter tops for a long time now and I was not looking forward to trying to move those huge pieces and having giant seams in weird places. Once again, you have found the perfect solution! Oh, that is pretty darn cool! This was on my want-to-do list at my last place but like you I couldn’t figure out how to make it work. I lived in a townhouse, where was I going to put those forms, how on earth would I move them after?? This is a super idea, and I can absolutely see you knocking this out of the park! Love the fancy edge options too! Can’t wait to see your posts on concrete counter tops, they are going to be amazing! Very interesting post… Kristi!!! I really very glad to read this as many new things I did knew. And the DIY tips that you have shared are great and useful. Thanks for sharing this information. 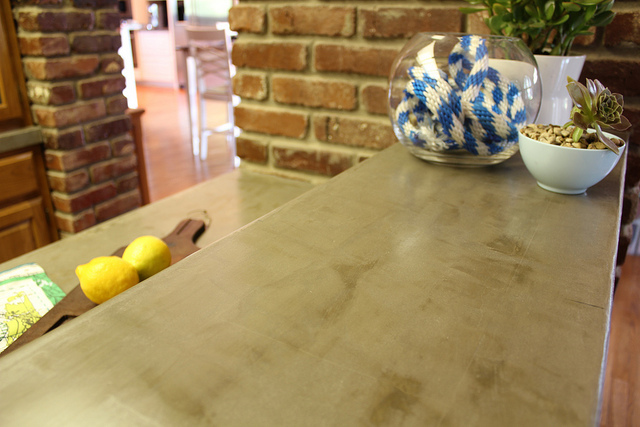 If anyone can figure out how to install a beautiful concrete counter, I believe that is you! You are very talented and so generous to share your projects with us. Sorry for the delay with your new home but it will be worth it all once you finally get there! 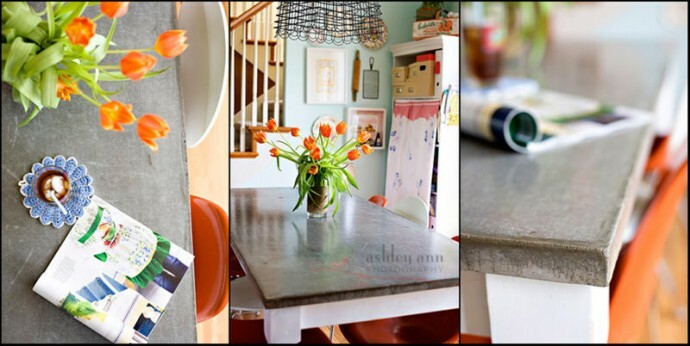 I love the look of concrete countertops. I agree with Dee; if anyone can figure this out and do it and have it look gorgeous, you can. I look forward to following your progress. You have great ideas! Wow. That is really cool. Now I want to do it!!! Don’t get down you’ll be there soon! Love concrete for counters 🙂 with an awesome support bracket to seal the whole deal! I have admired concrete countertops for years but am kind of intimidated by the thought of trying to make them myself. When there is absolutely zero room for error, things tend to go very wrong for me…lol. Right. Concrete countertops are the best because they are more durable and you’ll have no worries about them being damaged by termites. And they also add to the aesthetic appeal of the kitchen. Ever since I got married and we lived in our own home, we have been into concrete countertops already. I admire you Kristi, you will try anything…….and the thing is it always turns out great! !